Three months after her baby girl was born via caesarean, this delighted mum re-shared a totally adorable snap of their family post birth… reminding us that it may just be the smiliest birth photo ever! 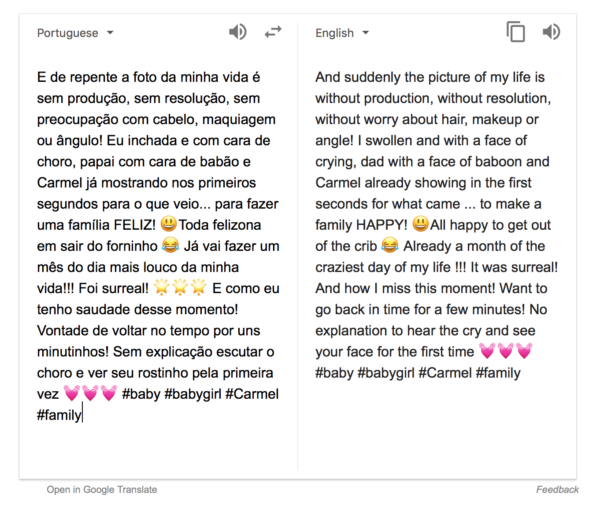 Lifestyle Instagrammer, Thaise De Mari, has had time to reflect on baby Carmel’s delivery – and the above cute and candid post-birth capture. She’s obviously realised the photo is so nice, it makes sense to share it twice! The internet is glad she did, because the grin-loaded shot is going viral as we speak. Excitingly, it’s not the only smiley shot of this baby. Thaise’s Instagram is dotted with similar adorable shots of a very happy baby Carmel, pushing her to the tip-top of the leaderboard in the happy baby stakes! It’s probable that these photos are the cure for Monday morning blues we’ve all been searching for. Scroll through and prepare to squee..! Carmel was born on (or close to) December 10th, weighing 3.4kgs. Her mum kept the details pretty scant when she posted the adorable shot the first time, possibly still in the postpartum fog. Three months later she’s cracked out the image again on Instagram, with a little bit of background on the pic. We’re not 100 percent sold on all the details of the Google translation of Thaise’s update (below), but the sentiment is clear. This un-styled, candid snap of the seconds after Carmel entered the world has captured this life-changing moment perfectly. It smacks delightfully of unbridled happiness and excitement! Everyone was obviously stoked when Carmel showed up. We quite like the dad-baboon bit, but mostly we love the smiley, goofy joy this photo brims with. Happiest post-birth gang capture ever! What do you think? Is this the smiliest baby ever? Or do YOU have a world-beating smiley-faced kiddo at your place? !